Some time ago, I was at a workshop with about 11 colleagues. We were asked who our heroes or role models were, and not one of us – not one! – could think of an answer. Put on the spot, the only person I could think of was Myleene Klass, and much as I admire Myleene – she is lovely and clever and pretty and talented after all – I knew that I did not want to go on the record as saying that the ex-Hear’say singer was my hero, no matter how nice and glossy her hair is. The question of why none of us could think of a hero or role model preyed on my mind. Now, if I could go back to that seminar room, I would say, without hesitation, that my role model is my Grandpa, Ted Hay, who passed away peacefully today at the age of 93. The best way to describe him is that he was a gentleman, and a gentle man. He belonged to the age where people still wrote letters, lovely handwritten letters with beautiful cursive penmanship, which filled pages and pages with news and observations about the world around us. His letters helped me fight off the homesickness that struck when I first moved abroad, the words bringing me closer to my loved ones. I come across these letters every so often and always marvel at the love within them. In an age where e-mails can be dashed off in seconds, a letter is still something to be treasured. If my Grandpa enjoyed a show at the theatre, he wrote to thank them. If someone gave him good service somewhere, he wrote to express his gratitude. I still remember (probably getting on for 30 years later) writing a letter with him to the BBC thanking them for screening the cartoon The Blue Danube (of course, you can just get it on YouTube now! ), which had delighted me. Every year I make the resolution to write more letters but I never manage it – I really must try harder. I’ll do it for him. My Grandpa could probably have told me exactly when it was that we wrote that letter to the BBC – every day he kept a diary of everything from the sublime to the ridiculous. If you wanted to know what he had for breakfast on a particular day 19 years ago he could probably have found out! But there are gems in there too, full of happy memories. When I was planning my wedding six years ago, Grandpa was able to look back and give a round-up of the weather on April 21 through the years. His forecast for the day was, of course, spot on. Since March last year I have also been writing up my days in a five-year diary, just like Grandpa’s. 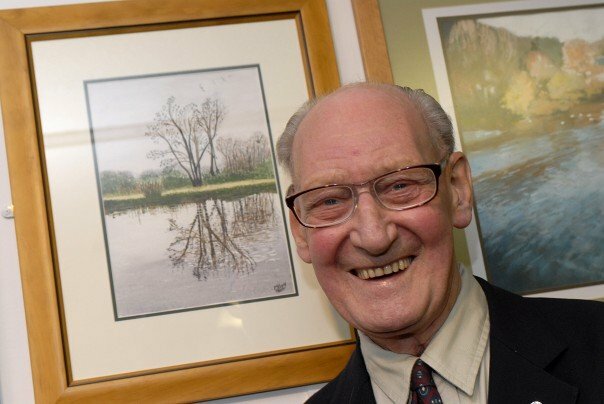 He was enthusiastic about everything, from his weekly art class to the handmade cards he made for every special occasion, from gardening to jokes, from Tom and Jerry to the Vicar of Dibley. It was wonderful to watch him with my younger cousins and know that we used to do the same things when I was their age, like growing vegetables together or having story time. He may have been slower, but the twinkle in his eye was just the same. And seeing him gleefully banging a metal tray with a wooden spoon to the delight of my baby son, the next generation, was a real treat. Little anecdotes – that the fact that my Grandpa’s former girlfriend desperately tried to win him back after he proposed to my Grandma – really help to remind me that my grandparents were young once too and I find it fascinating. My grandparents were married for almost 70 years and complemented each other in every way. I only hope that my husband and I will be able to emulate them, an inspiration, two halves of the same whole. You should not have underestimated the will of this gentle man – his strong beliefs lead him to be a conscientious objector during the war, along with his brothers. His brothers served time in jail for their stance, and he said he wished had done the same rather than work on the ambulances. Even in the chaos of wartime London, my Grandpa’s aim was to protect and conserve life. A Methodist lay preacher, he stood by the commandment “Thou shalt not kill”, in the face of what must have resulted in great social stigmatisation. He didn’t talk about it, and neither did we. Nor did we really talk about the fact that he planned to leave his body to medical research, until it had to be discussed. Even now that he is no longer with us his care for others continues. Grandpa claimed the only “heroic” event in his life was when he was a six-year-old page boy at his cousin’s wedding dressed in a white satin suit. The dressmaker – either by design or accident – left a row of pins in the trousers and everyone thought Grandpa was such a good boy to stand so still, although the truth was he had no choice. But Grandpa, as far as I am concerned you were a hero through and through. If I can try to live up to your standards and be even half the person you were, I will have done well. Thank you for everything. I will miss you so much.